As one ages, skin volume and collagen under the skin diminishes. When skin loses its tone and elasticity, lip lines, as well as other facial lines and wrinkles start to form, and become more visible. Wrinkles around the mouth, referred to as perioral wrinkles, are caused predominantly by age, genetics, sun exposure and smoking. Unfortunately with age, the lips also become thinner and lose volume over time. This can cause a thinning of the upper lip area creating wrinkling above the lip. These lip lines have also been referred to as “smoker’s lines”. Smoking has a drying effect on skin and is known to accelerate the formation of wrinkles and loss of skin tone. Even if someone has never smoked, the repetitive motion of pursing the lips together, like sipping from a straw, whistling or just over expressive speaking can also cause creases to form. The face is the only part of the body where muscles are directly attached to the overlying skin. Therefore, every time the muscle contracts, the skin moves with it. The more you use the muscle, the more skin wrinkles. If these lip lines are neglected, they become more permanently ingrained and a challenge to treat. Botox treatments can be a good option for paralyzing the muscles around your mouth that cause these lines to form. By relaxing the muscles around the mouth, it prevents over expression. Some patients find this option not suitable, as it impedes upon their speech pattern and is not always an appropriate treatment option. Although Botox treatments work for some, it is not permanent, and results will only last 3-4 months. Lasers can be safely and effectively used as a treatment to reduce lines and wrinkles around the mouth. Laser devices such as Thermage, Fraxel, as well as Ultherapy are very helpful at skin tightening and are specifically designed to boost collagen naturally. Fraxel lasers produce a similar type of micro-penetration. Lasers use high heat to penetrate the skin, which can produce damage to healthy tissue, thereby causing pain and longer downtime. Micro Needling also referred to as Skin Needling or Collagen Induction Therapy (CIT) is unique in its own way. It involves repeatedly puncturing the skin with tiny, sterile needles in order to stimulate the skin’s natural self-repair mechanism to create new collagen. The new collagen starts to form fairly quickly due to the body’s wound response to the treatment. Fine lines are reduced as new skin replaces old. The production of collagen and elastin is increased dramatically and formation can continue up to 6 months. Micro Needling is a minimally invasive skin tightening technique that is totally natural, without the use of lasers or ultrasound, and reduces fine lines and wrinkles. The healing process produces permanent structural changes in the skin which result in better skin texture and long lasting improvement. Another advantage of Micro Needling is that it can be performed on all skin colors and types and is a preferred treatment over laser as there is no risk of burning the patient. 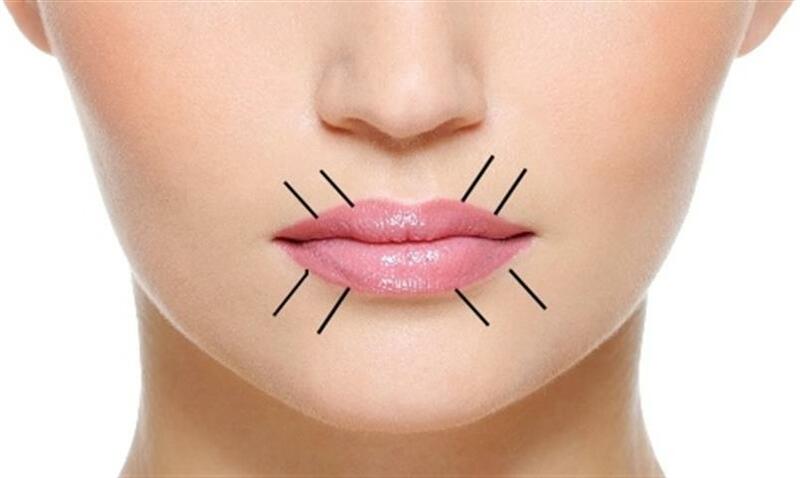 Patients who have Micro-Needling treatments for the lip lines will see an improvement after their very first treatment. The number of Micro-Needling treatments required is based on the depth and severity of the lines. Three to six treatments are needed to see impressive results. Micro Needling Treatments are generally performed 6 weeks apart. Choosing the appropriate treatment for your lip lines is vital since ever patients’ needs are unique. Even though lip line wrinkles are common, it doesn’t mean that you have to live with them. Visit us at Lasting Looks Anti-Aging and Laser Clinic to book a personal consultation to help us improve or erase the lines around your lip area.